So here we are, almost 20 years removed from the original Prince of Persia game, to have yet another relaunch of the series. I had played most of Sands of Time, a bit of whatever the next one was, and then nothing of the third from the last trilogy. So when I heard it was going to be a completely new story, I was hoping it would take most of it's inspiration from PoP: SoT. Lucky for all involved, it did. There has been a lot of talk recently about what makes a games story worth paying attention to. While the actual story of PoP is pretty generic, the narrative in which it's told is one of the more interesting mechanics I've seen. The game starts out with a bunch of tutorials wrapped in some nice video sequences that are all using the in game graphics engine so you never get fully pulled out of the experience. Sure, these sequences are nice, but the game really shines through in the interaction between Elika and the "Prince" during the gameplay. At anytime, you can hit the Left Bumper and begin a conversation. While this may seem odd at first, it actually helped make the character interaction feel more like something you were controlling rather than watching. It makes what would otherwise be a lackluster story into something you care about. And as you learn more about the characters, they become people that are much more interesting than at first sight. Structurally, the game is split into 4 worlds splitting off of a hub, each contains 5 levels: 4 main sections, and a boss section. While you can teleport to any of the levels that you've already cleared, each section is connected and can be run through in real time. It makes for some interesting achievements, but becomes basically a non-issue once you're half way through the game and can teleport near where you need to be. The four main levels are mainly jumping puzzles with some grunt fights along the way, and a small scale boss fight at the end. After that, the area is healed and you get to collect light orbs. These orbs determine which powers you can receive and which worlds you have access too. They never become much of a hassle because you will only need a small percentage of them to unlock all the areas. The boss sections consists a lengthy jumping puzzle followed by the final boss fight. These can only be accessed after the first four levels are completed. While the jumping is interesting, the fighting doesn't really change. In terms of the jumping puzzles, if you've played any of the more recent PoPs or even Ubisoft's Assassin's Creed from last year, you should be right at home. But take the difficulty down a notch. Running along walls, up walls, and even under ceilings, is incredibly easy. Basically just jump at whatever you're trying to run on, and the game takes over from there. Only needing input from you when you need to jump off, or tap the B button on certain things to keep the run moving. If you mess up and die, well you don't really die. Sure, in a normal game, it would be counted as a death, but instead Elika shows up in a nice cut scene to grab you out of the air and drop you back at the last piece of solid ground you were on. So really, it's just a very liberal checkpoint system. While running along stuff that shouldn't be physically describes most of the game, there are also a fair amount of combat situations. The combat is also pretty simple in that each of the four face buttons is a different move. One for jumping attacks, one for grabs, one for sword swings, and one for magic (or in this case, Elika). These can be chained together into some pretty long combos, but you'll usually smash the enemy into a wall before finishing it. There is a menu in the pause screen that shows how each attack can be chained to another, but it's almost indecipherable and not really worth the time. All you really need is a few combos memorized and you're good to go. There are really only two types of enemies. Your average grunt, and one of 4 boss characters. You'll only fight one of these at a time, which makes the combat more focused. It's not the best combat system, but at least it's more interesting than the waiting game that Assassin's Creed turned into. The combat also has the same kind of death system, but instead of dropping you back before the fight, you're enemy gains some of their health back. So yeah, the fights are kind of neat, but don't really mean anything because there's hardly any consequence for death. Now, all along Ubisoft has been saying the the graphics are not cell shaded, but I'd be hard pressed to describe it as anything else. It's really an interesting mix of classic polygonal characters surrounded by this really cool cell shaded look. So basically, I don't know why they would want to ignore the aspect that makes the game look really breathtaking. It's very stylish all around. All of the environments look great before and after they're cleansed and the characters are always great looking. The animation is generally good, but it can look odd sometimes when one animation jumps over another either during combat or when jumping around. But for the most part, they all move really well. 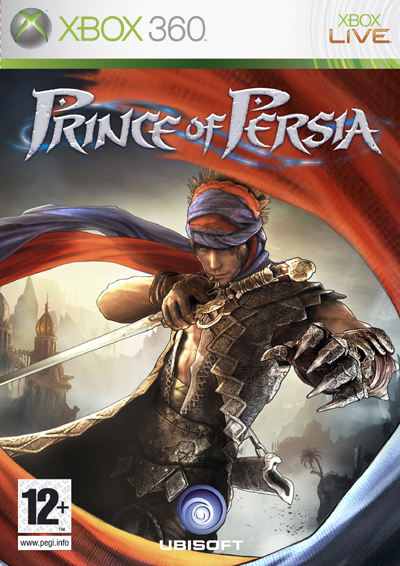 I really enjoyed Prince of Persia even if I wasn't super happy with how it ended. But I guess that's what the new DLC is for. But on it's own, PoP is a great action adventure game. And even with it's few flaws, is worth playing. But if you don't mind the relative ease of the game and not as lengthy game time, it's worth getting it for your shelf. 4 out of 5 light orbs.